Back to the tips.On average, produce has to travel 1,500 miles before it can even get to the shelves. In his book, Deep Economy, author Bill McKibben takes a look at the Food Miles of produce consumed in Iowa. Carrots, from California, travel 1,690 miles. Potatoes, from Idaho, travel 1,292 miles. Chuck roast, from Colorado, travels over 600 miles. And these three examples are purely domestic shipping. 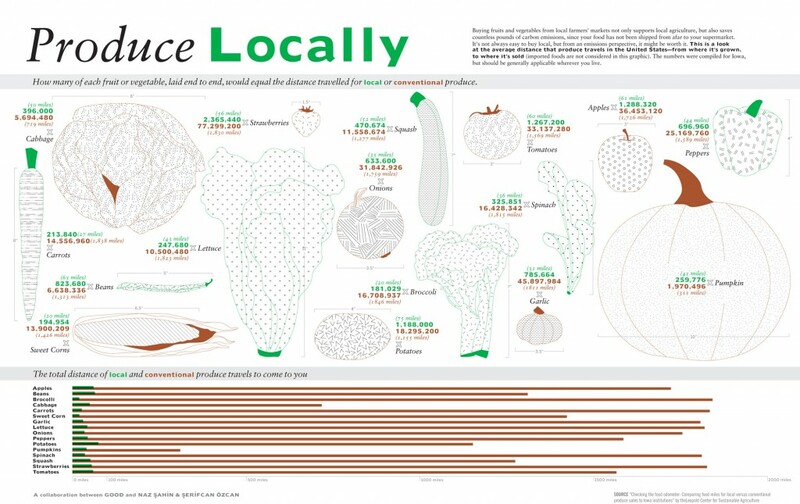 Take a look at the Food Miles of these different fruits and vegetables below. How can you avoid this? Check out your local farmer’s market, co-op, or community-shared agriculture (CSA). Not only will you decrease the environmental impact of your food, but you will also be able to support your local community. (If you are ever in Rockland, Maine, we suggest the Good Tern. Their cookies may be a guilty pleasure, but at least you can feel good about buying locally.) Want to find a farmer’s market, co-op, or CSA near you? Head on over to Local Harvest. They can point you in the right direction.